Given the long day we had had, I was surprised that I wasn’t sleeping well past noon. As it was, we were up at a reasonable hour and I was eager to get out and explore. I was brushing my teeth as I was trying to plot our day when I felt something solid in the toothpaste froth. With disbelief I realized that I was looking at a spall from the back of my tooth. Not a little chip. A full-on spall that ran the width of my bottom front tooth. I couldn’t stop myself from running my tongue over what felt like a new shelf on my tooth. I guess those peaches were a bit harder than I thought. You know what cures dental ails? Beignets! That’s right. One of the women that had been on our ghost tour in Savannah had told us that we just HAD to go to Morning Call. So we went. It turns out it was a short drive away in City Park. With the address plugged into my phone, we soon found ourselves at the park. And it is a big park with a sculpture garden and amusement park and botanical gardens. 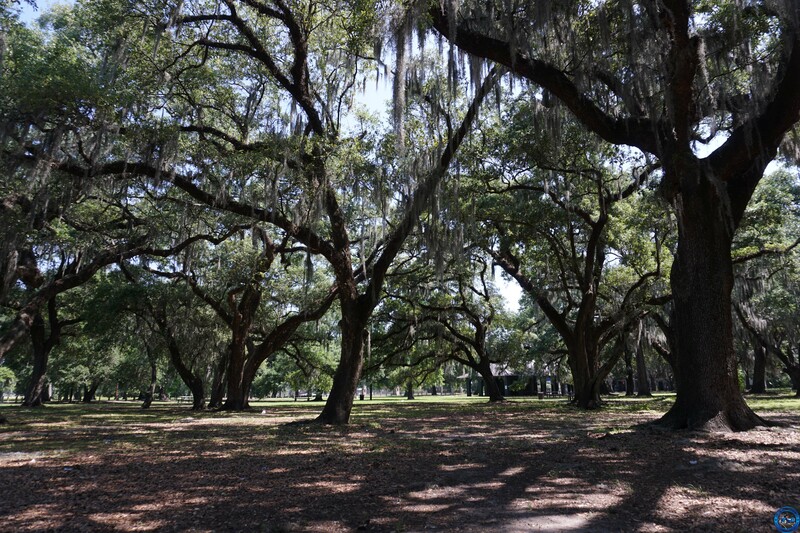 Large trees kept huge patches shaded with drapes of spanish moss. It was lovely. Problem was I couldn’t find what I was looking for. I wound my way down the many roads until finally I parked the car in the darkest spot I could find and unloaded the dogs to do some reconnaissance on foot. Well I had been looking for a shop or a sign but the cafe was in what looked like an historic building with a large patio. It was well-back from the main roads and there was plenty of cover from plants and trees. Yeah…that’s it. Cut me some slack: I was un-caffeinated which does not help with navigation. After I asked if the dogs we allowed on the patio (and they were), we sat in a cool corner and enjoyed the breeze from nearby Lake Ponchatrain. The humidity was already building and having come from the colds of Canada, it was a bit of a shock. I perused the menu then finally asked my server what “the” New Orleans breakfast was and with nary a pause he said “beignets and cafe au lait”. Done. 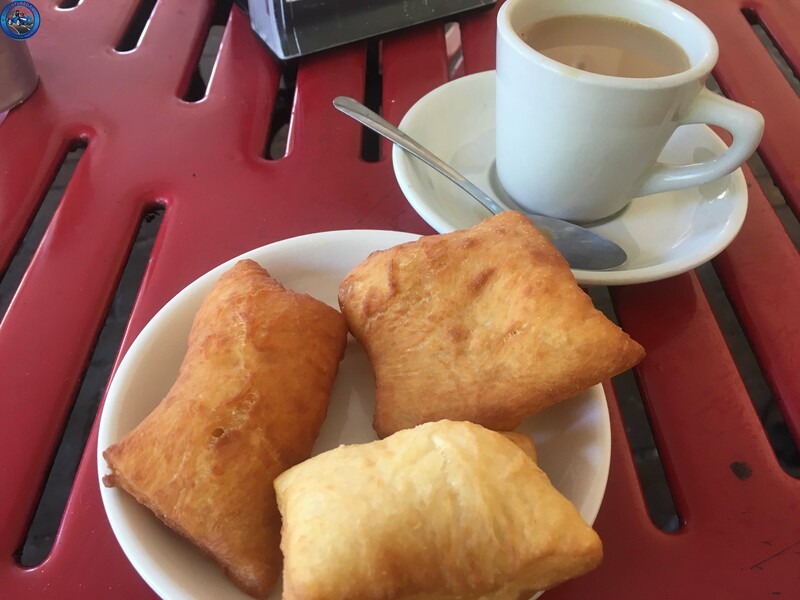 And in short order, I was looking at a plate of soft doughy pillows and creamy coffee. I had thought there would have been a generous dusting of icing sugar but as I was still feeling a bit full from dinner, I figured a little less sugar was not a bad thing. The beignets (pronounced ben-yay) come in orders of three. Each one was a little smaller than my palm and they were still warm when I bi t into them. A firm but yielding crust with a light interior, these little jewels of dough had such a wonderful flavour, especially with a little sip of the cafe au lait. It wasn’t until I had finished the last one that I saw the large shaker of icing sugar on the table. I was un-caffeinated when I sat down remember? Across from where we sat, I could see part of the sculpture garden and I was excited to walk the dogs through there. Until we got to the gate: dogs aren’t allowed. I briefly considered “not seeing the sign” but I just couldn’t be that tourist that acts as though the rules don’t apply so we walked by and admired the artwork through the wrought iron fence. We had to walk past the amusement park and lines of children that were filing in. I have to say, we didn’t have many outings like that when I was in school. Of course where I grew up, the nearest amusement park was over an hour away so it’s a bit more of an ordeal. Some of the kids wanted to pet the dogs and a few even got pictures with them. The dogs handled the attention really well and even caused a few squeals when the kids were at the receiving ends of some sneaky dog kisses. We walked around in the shade under some trees. Leo took the opportunity to get a good roll in before we hopped back in the car and headed over to Magazine Street and the Garden District. See, The Big Fisherman is on Magazine Street and it was one of the first places featured on “Feasting on Asphalt” so we went that way. I still needed to get my crawfish after all. I navigated through construction and one-way streets that still moved really smoothly and I thought about sending an e-mail to Toronto City Counsel to suggest that they take a few notes to maybe improve the traffic flow in Toronto. I drove around and finally parked the car on a side street, shocked that there was no parking restrictions. I mean, we were a block from Magazine Street and there was nothing limited parking. My mind was blown since I’m used to so many streets in downtown Toronto, even side streets, with parking metres. But hey I wasn’t complaining. As we were walking down Magazine Street, my eye was caught by a storefront as we passed. Petcetera NOLA. Hmmmmm the “Pet” part suggests a pet store so we wandered on in and were greeted by a call of “Babies” as the owner walked towards us with his arms wide open. The dogs were in heaven. There were fancy dog treats everywhere and they had a few samples of peanut butter drops. A woman was there with her new French Bulldog puppy and this little thing just barked and growled at the dogs. She was so tiny even Leo towered over her. It was so cute I had to video her (it’s on our YouTube channel if you’re curious). Once we had caused enough trouble with a sassy little puppy, we left and continued on to The Big Fisherman to find it…closed. Closed on Tuesday and Wednesday. Huh. So if I had come yesterday instead of wandering the French Quarter, I would have been able to have my crawfish. Darn. When I looked around me, I saw that Dat Dog was a short distance down the road. 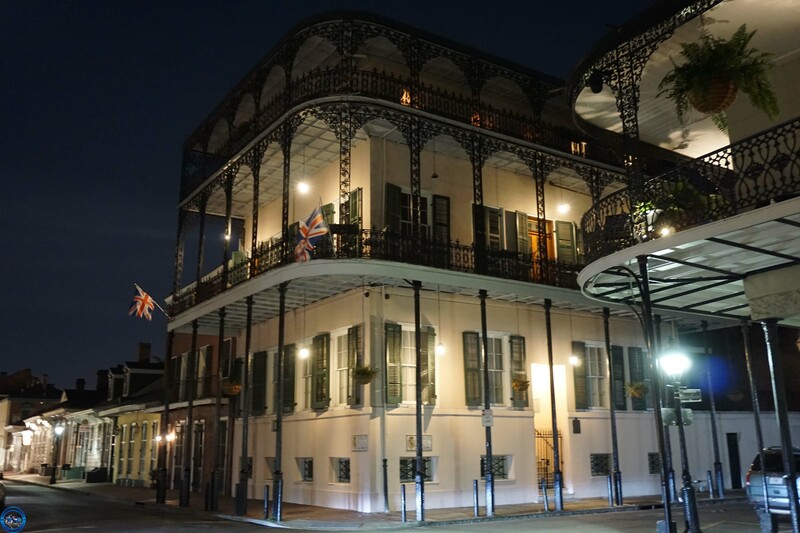 One of my friends had recently come back from New Orleans and had told me that I had to go. And it was listed as being dog-friendly. So that was where we headed. We were on the north side of the street, preparing to cross to the south side at a set of lights and were stopped near some tables on the sidewalk that were next to a restaurant. There was a woman sitting a table close to us reading and Piper kind of walked towards her. Now Piper was not close enough to touch her and wasn’t lunging at her but this woman leapt out of her chair, pressed herself against the wall and yelled “No!” Even Piper seemed to have taken slightly aback as I pulled her away. I was really surprised by this. I get that some people are scared of dogs. And maybe she thought that Piper was approaching her. Fair enough. I try really hard to keep my dogs from people that don’t want to be near them out of respect. Having said that, we walked towards this woman in the direction she was facing. She was on a patio with no barrier. If you’re that terrified of dogs, poke your head up every once in a while and check for one. It’s not like we could sneak up on anyone with the squishy face crew that I have. I tried not to let it bother me since I was really worried that I had done something wrong somehow. I hate the thought that my snuggle bunnies would scare someone. We continued on to Dat Dog and sat on the patio outside. 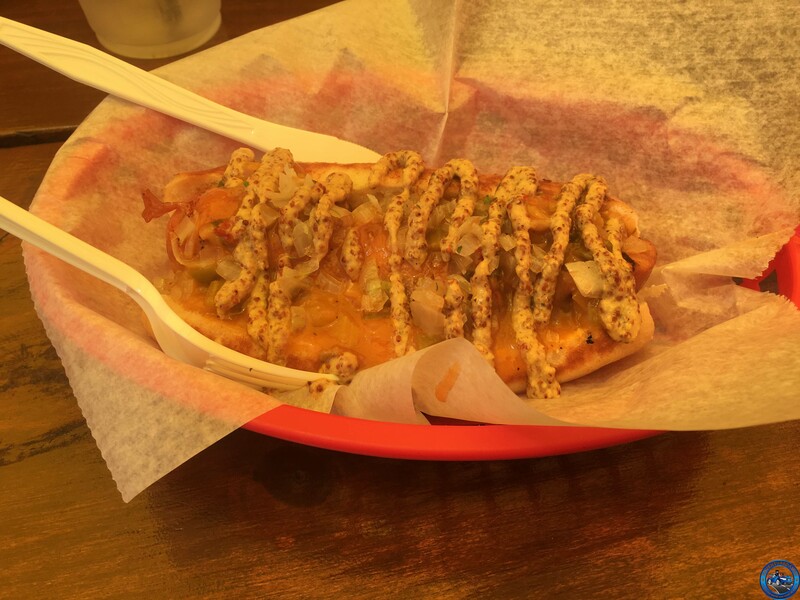 I read over the list on the menu of specialty hot dogs and toppings, then asked for the most southern thing on the menu and he suggested that I order the étouffée dog which is a hot dog with crawfish and mustard (hold the tomatoes please). I was tempted to order fries as well but decided that I needed to save room for…whatever we found later. The staff provided a big bowl of water for the dogs and soon my hot dog followed. It was…good. Just good. I thought the mustard overwhelmed the flavour of the crawfish. At least it was filling and I was glad that I didn’t order the fries. 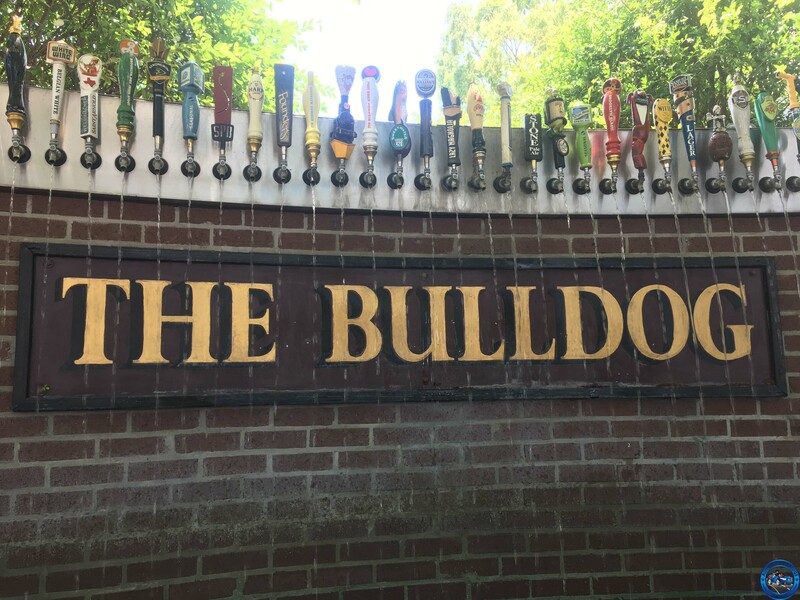 We left Dat Dog and we had walked less than a block when we came to The Bulldog. I saw a puppy on the patio and thought “a nice shady pub patio is just what we need”. If you’re just passing through the restaurant, you can bring the dogs with you which is nice because it gave them a chance to enjoy some air conditioning and a cool floor while I grilled the bartender about the beer. I should note that they do not have table service so you have to collect your food and drinks yourself. I selected a seat near the fountain at the back of the patio. It was a lovely place to enjoy some shade and people-watch with a delicious local craft beer while the dogs sprawled out on the ground around me There was a sign next to the fountain that said all donations go to local animal shelters. I reached into my pocket and pulled out four quarters, laying them out on the table in front of me. I picked up each quarter and held it out to each dog, letting them touch it with their nose before I tossed it into the fountain. One quarter for each dog and one for me. Yes it’s silly. I’m OK with that. We walked back to the car, which I found with none of the issues I had had the day before. On the way back to our Airbnb, I noticed that we would be passing a seafood place with lots of positive recommendations. The kind of place that the locals go to get seafood. We had to stop. I parked the car and strode into the restaurant/seafood market. The place went silent. It was like those westerns where the hero walks into the saloon and everything goes quiet. There was no hostility, just the looks that said “you don’t belong here” since I was the only white person there. As if I’m going to let a little thing like that stand between me and seafood. I ended up ordering a pound of crawfish, a pound of boiled shrimp, a small gumbo, and a chunk of corn and a potato. 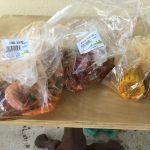 What I got were separate plastic bags of shrimp and crawfish and corn and potato. Not what I expected but I wasn’t complaining. I took my bags of food and sat out on the patio outside my door and devoured it all. As much as I like seafood, this was a lot of work. 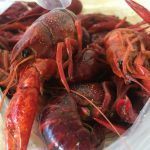 If you’ve never had crawfish, imagine teeny lobsters with teeny tails. And you have to crack open every tail. It’s a lot of work. And the shrimp were whole. The entire affair was so messy that I was glad I sat outside and near a hose. 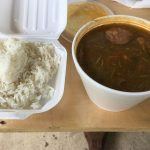 The gumbo was good but nowhere near as delicious as the gumbeaux from Sassafras the night before. Finally, the last crawfish was emptied, the last shrimp peeled, and the last bite of gumbo consumed. After cleaning up my mess, we went inside and collapsed for some digestion time. Close up of some crawfish. But not for long. 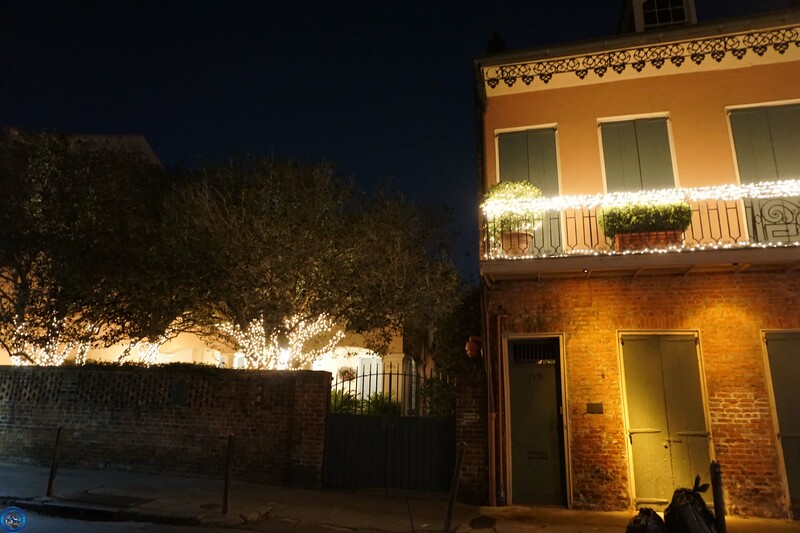 We had one more thing to do and soon we were in the car heading back to the French Quarter for yet another ghost tour. I parked the car at a lot with plenty of landmarks and we started walking to our meeting place. 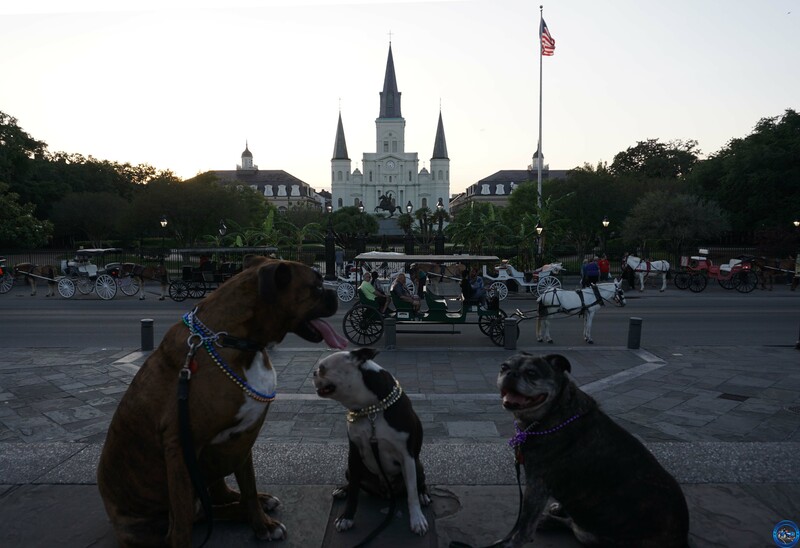 The dogs were strutting down the streets, each one rocking beads, and getting plenty of admirers. 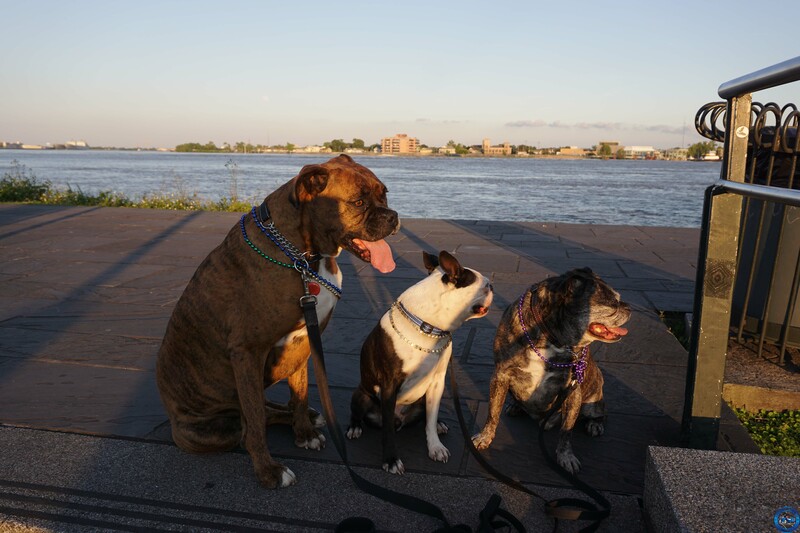 We were early so we took a slight detour to the levee where they stopped for a few photos. 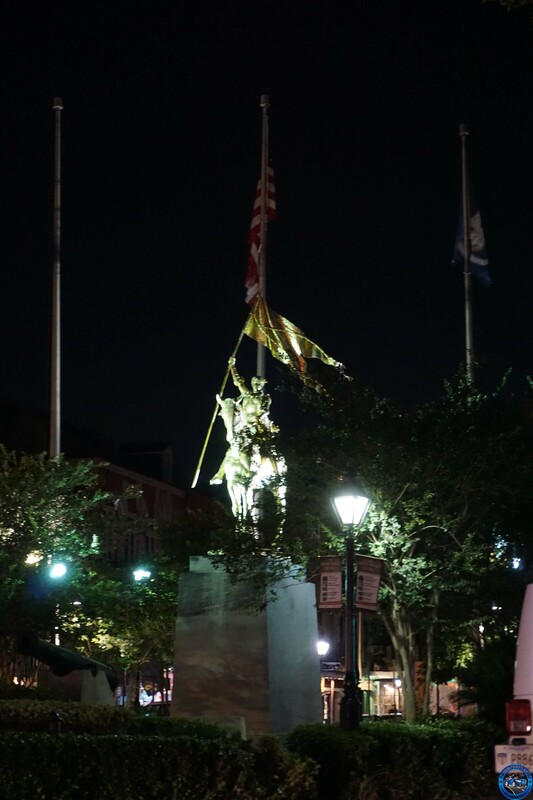 We were looking across the street to Jackson Square when all of a sudden, I heard bagpipes from behind me. I literally had chills run up my spine. We waited there for as long as we could enjoying the performance. The boys were more interested in the horse drawn carriages going past on the street below but Piper intently watched the man play with just the slightest wag of her stump. Seemed appropriate that she would like bagpipes. Finally it was time to go to 723 St. Peter Street to meet with our tour group from Haunted History Tours. The ever growing knot of people on the sidewalk welcomed us…well the dogs anyway. I checked us in and was handed a sticker that got us the 2-for-1 hurricanes that were included with the price of the tour. I couldn’t leave the out on the narrow sidewalk and I huddled in the door, hesitant to bring the dogs inside Finnegan’s. A wall of a man was standing at the door and I asked him if he was bouncing. He shook his head. Hmmmmmm. I glanced around me and when I couldn’t take any more shoving, we darted in to the back corner of the bar. It was busy and it seemed like there was only one harried bartender. Finally he came to our end and I ordered a hurricane and a glass of water. He looked at me and said “two” as he began pouring. I enjoy hurricanes and they go down REALLY easy. But I did have a drive to make so I handed one of my drinks to some guys at the bar and shuffled the dogs outside. We didn’t have to wait long before we met our tour guide, Jack. I’m not good with names but for some reason I found this one easy to remember. Unlike other guides we’ve had, Jack didn’t carry any aids other than a cane with a carved tiger’s head painted with matching white and black stripes. In his heavy southern accent, he told us that when he grabs his tiger by the tail, we huddle up. And then we set off. 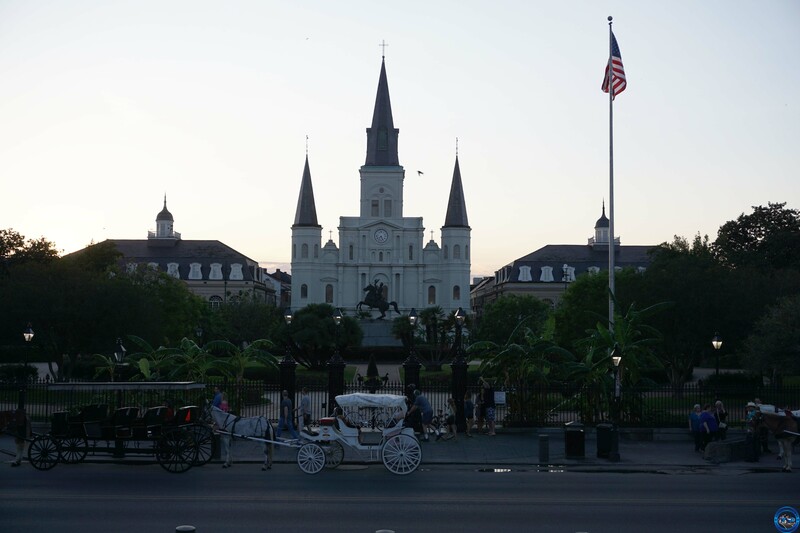 At first, we stayed in the thick of things, passing by Saint Louis Cathedral and learned of the bloody history of Jackson Square. Soon though, we found ourselves on mostly empty streets. This tour also had a brief stop partway through at a pub where we could purchase libations and use the facilities. At the end of the tour, I learned that some women had been filming Jack (the person) while we waited for the group to set off again. When she reviewed it we saw a tiny blue light, like a laser pointer that moved around the screen. It appeared to move completely independently of everything else and there was nothing that anyone could remember that could have caused it. Jack seemed completely nonplussed by it. After the tour, we left the group and walked back to the car. I was tempted to stop for a late night snack and to watch a blues band at Cafe du Monde but one look at the crowd changed that plan. Besides, a comfy bed and plenty of snuggles were waiting. Oh and in case you were wondering, we’re from a small town outside of Toronto, Ontario and Toronto is often called the Big Smoke. I thought it sounded better than “a small town girl with three dogs”. 2 response to "Big Easy Meet the Big Smoke"
Oh dear, not more tooth troubles. You did warn me. Glad everything else went well.